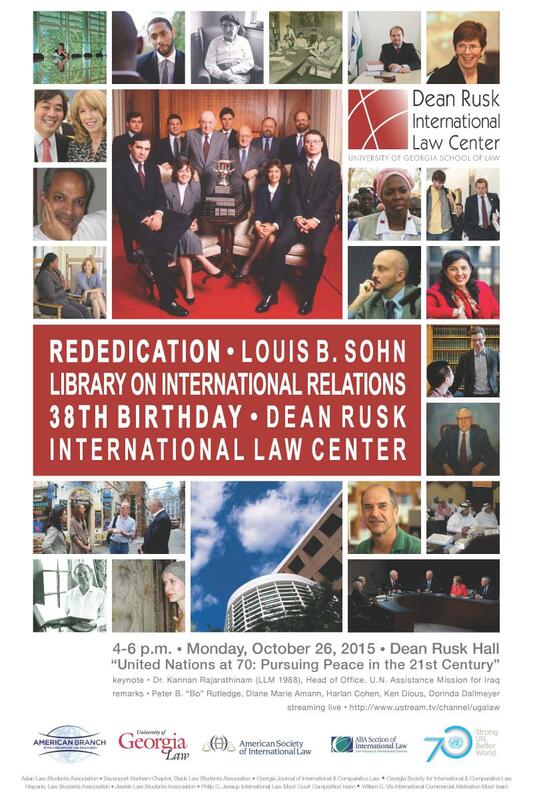 Our tradition of excellence in international law began about 75 years ago, when noted German-Jewish judge Sigmund A. Cohn arrived at the University of Georgia School of Law seeking refuge from the ravages of World War II. Other professors reinforced the tradition he began – among them Dean Rusk, who joined our faculty after decades of service as the Secretary of State to Presidents John F. Kennedy and Lyndon Baines Johnson, Louis B. Sohn, a scholar who helped draft the Charter of the United Nations and the U.N. Convention on the Law of the Sea, and Gabriel N. Wilner, an expert in dispute resolution who mentored both LL.M. and J.D. students and was instrumental to the success of our summer study abroad in Belgium. Milestones in our history range from the 1990 global victory of our student team in the Philip C. Jessup International Moot Court Competition to an historic 2008 U.S. Secretaries of State roundtable to our 2015 Center rededication, keynoted by an LL.M. alumnus who is head of office at the U.N. Assistance Mission in Iraq. To this day, the top-ranked international law offerings at the University of Georgia School of Law prepare students to practice in areas as varied as business and trade, arbitration and dispute settlement, the environment and sustainable development, human and children’s rights, and global governance and collective security.